The school we visited for one of our dental education programs was also a recipient of a rotary donation to repair the roof that had been torn off due to typhoon Yolanda back in November. Our visit also coincided with the special dedication of the new water treatment facility and school reconstruction. The school was a small rural school in a poor part of the province that I am sure no white people had ever visited before. The children had nothing in their classrooms, but their desks, and not a single thing on the walls. It was a blank environment void of any bright or child centered decorations. It broke my heart to see that these teachers had no materials to enrich their learning environment whatsoever. Luckily, we had brought three bags of art supplies ranging from scissors, bright paper, glitter, glue, markers and the big boxes of crayons, etc. 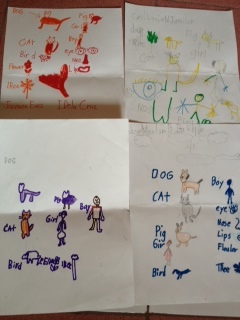 The kids seemed delighted when we sat down and drew pictures of cats, dogs and flowers. Though it felt good to be able to add something fun to their day, I also felt sad knowing they still need so much more. This entry was posted in Uncategorized and tagged art project, dental program, Kalbio, Mending Faces, outreach, school, typhoon Yolanda.